Depending on what type of format you are looking to convert to this software will convert or encode into the following audio formats. These are MP3, WAV, OGG and FLAC. 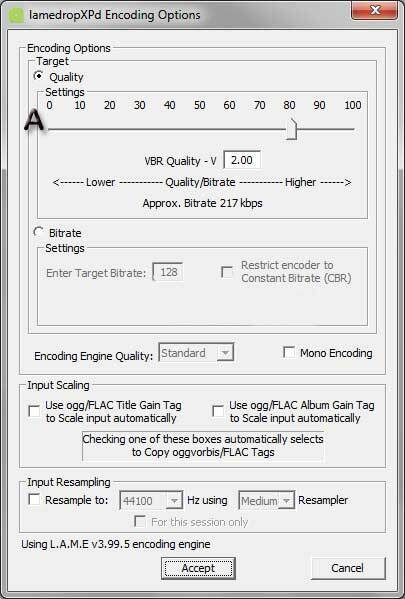 Flac is one of the better options and are most commonly used for the Lame encoder. LameDropXPd makes away with the command line type of Lame interface. You can see the user interface below so see how easy it is to use. What this software brings to the market is portability. Its the one reason why it is still so popular. You can run this GUI from a USB drive with or without a USB driver. Since it does not need to be installed Windows registries are not affected and you can use it from your USB drive as part of a toolkit which you can keep handy for both your home or office or clients computers. Batch conversion or encoding is also possible and much like the other GUI LameXP you can drag and drop you files into the GUI interface without having to find or browse the directories. Auto tagging is also possible in the advanced settings. The most common work done is WAV files to MP3 conversions as well as the transcoding of all your current and future Ogg Vorbis files. You can also decode MP3 files into the WAV format. The file is very small being just under 2MB and you can download the file below. You can see the graphic that you can set the quality very easily or you can use the option of using the bitrate to set the quality for the audio file. Normally the better the quality of the audio file the large the file will become.